Problem 2: One of my columns was not illuminating. I knew the lights and diodes on that column were fine since they illuminated when I crossed a hot wire over from a working column. I double checked the soldering from the button board to the breakoff pcb. I switched my IDC cables to rule out a fault in the connection from the breakoff PCB to the shield PCB . The faulty column’s hot pin passed a continuity test from the button board all the way to the shield PCB, so I figured the problem had to be coming from the shield. I thought this was weird as every other signal coming from the shield was perfect at this point. Could a single pin on my LED driver be dysfunctional? Solution 2: Turns out the the problem was simpler, yet more surprising. The faulty column’s connection on the shield PCB from the IDC headers to the LED driver was visibly broken! (see image below) I guess Chinese circuit board printing robots aren’t so perfect after all. Fortunately, this was a quick fix. All I did was solder a half inch wire on the bottom of the PCB to connect the two joints and I was in business! This was my first DIY hardware project and it was a great experience. Soldering is surprisingly easy. De-soldering is surprisingly difficult. Sourcing parts on Digikey is dauting, but opens your eyes to the infinite universe of electronic parts out there (as well as how inexpensive they are if you buy in bulk). Debugging hardware with a multimeter is the only way to find the root of your problem. The feeling I had the first time I toggled LED’s from my computer via Monome Serial is on par with the first time I set up a webserver. I think I have a new passion in this stuff! Thanks again to all the people who helped me see this project through. My next project is a (non-button) DMX controlled LED matrix based on the prototype boards over at Brilldea. I’ve actually already started. More details to come! I’m nearing completion of my Arduinome. Everything is soldered together. 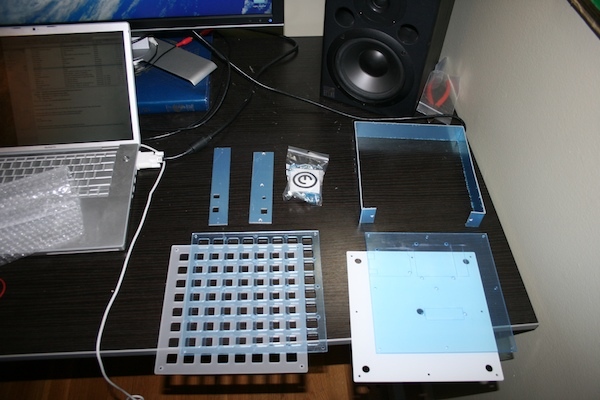 After I work out an ArduinomeSerial quirk, I should be ready to close up the enclosure and start jamming on it. Here’s some construction pics. Click on them for the high res Flickr set. More documentation to follow. I received my Arduinome Enclosure from Machine Collective today! Now I am waiting only on my shield pcb. Below is my parts list with links to where I bought everything. Prices do not include shipping. Another Note: Since my last post, I’ve opted to go the simple route and build a monochromatic Arduinome. This is my first DIY electronics project and hijacking the monome 256 protocol to run three separate LED channels just sounds too involved for me at this point. I love the simplicity Ableton Live and other software brings to electronic music performance. It relieves the stress of beat-matching, enabling dj’s to focus on timing, effects and track selection. It also saves them an expensive collection of vinyl. However, the experience of watching a dj stare at their laptop on stage leaves much to be desired. You can’t see what they’re doing and it almost feels like they’re ignoring you. Sure there are MIDI interfaces that simulate real hardware, but can anyone besides fellow dj’s comprehend subtle knob turning? laptop performances struggle to be viewer friendly. What I find so appealing about these devices, though, is how open they are. You can program the buttons to do whatever you please by adapting one of several open source projects to your needs. The hardware schematics are also open source. The Monome has problems two though: availability and price. Enter the Arduinome, a do-it-yourself Monome clone powered by the open and inexpensive Arduino microcontroller. Once its custom firmware is installed, the Ardinome is recognized as a Monome and can run all the same software. As you probably guessed from this post’s title, I’m building one. I’m completely new to DIY electronics, but learning the basics about the Arduino through these tutorials was quite straightforward. Soldering isn’t nearly as difficult as I thought it would be. It’s a pleasant change from programming. Now that I’ve gotten my feet wet with the Arduino, the next step is to source parts for the rest of the Arduinome. A complete parts list, as well as step by step construction documentation can be found at Basement Leds. Today I ordered a beautiful looking enclosure from Machine Collective and joined a group order for the pcb shield on the Monome boards. Next step is to pick up a sparkfun button pads and pcb’s. A decision I’ll have to make soon is whether to construct a traditional Monome/Arduinome with monochromatic leds (as document in Basement Leds), or step to Julien Bayle’s full color rgb “Bonome”. Julien told us on the Ableton board that he’s got one up and running without a hitch and that he will document the process on his site in the coming weeks. As dumb as it sounds for a novice like me to take on the additional challenge of making my Arduinome rgb, I’m leaning towards that route. More on this to come! Here’s a link to to my “2008 Mix”. It’s called the 2008 mix because it’s taken me the better part of this year to put it out (not a good thing). I did pretty much all automation for it on the eve of my self imposed deadline. Lesson learned. More mixes to come soon I hope!